The year is 1568, and Emperor Akbar, greatest of the Mughal dynasty that ruled the Indian subcontinent for three centuries, makes a desert pilgrimage hoping for a male heir. His wish is granted in the form of Salim, though unfortunately he’s a born profligate. Akbar, seeing that ease and pleasure are spoiling his child, commands him to lead an army through 14 years of triumphant warfare. He returns a hardened general, with tasteful dabs of blood accenting his face. 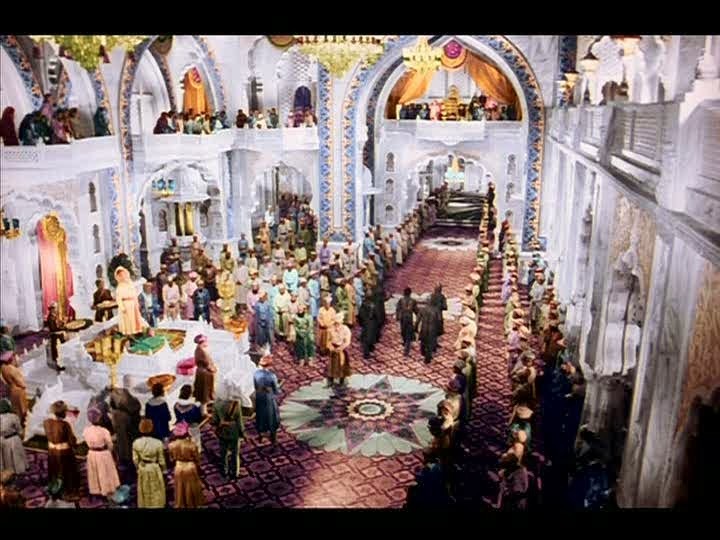 During the festivities celebrating his homecoming, prince Salim is presented with a breathtaking sculpture that turns out to be Anarkali, a modest court maid gifted in song and dance. Salim and Anarkali fall instantly in love, secretly passing poetry by floating lotuses down the palace pavilion’s fountain-fed private river. The jealous Bahar, an ambitious rival dancer, makes sure the affair is discovered by Akbar. The emperor is outraged by Salim’s intention to marry below his station and makes every attempt to hinder the couple, including chaining Anarkali in the dungeon. Salim respects the sovereignty of his esteemed father over a vast kingdom, but defends the freedom of his heart. Their relationship breaks down, leading to shouting matches, ultimatums and war. Tragedy ensues, but only after Salim and Anarkali are granted a few precious hours of happiness. Emperor of the Mughals is, if one adjusts for inflation, perhaps the most the successful Indian film ever made and certainly one of its most enduringly popular. It is emblematic of the Bollywood blockbuster model: a timeless obstacle-laden romance writ on a larger-than-life scale, big-name stars, lavish production values, memorable musical numbers and, of course, a three-hour running time. 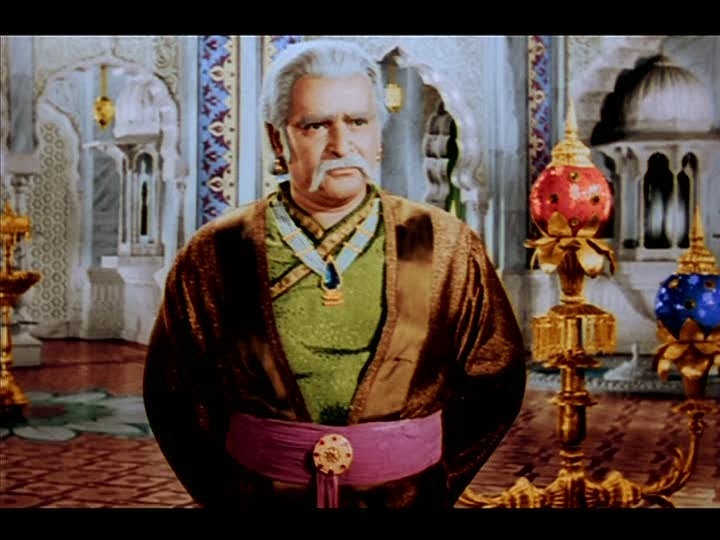 Director K. Asif overcame titanic production setbacks to get it made (shooting first began in 1946, fourteen years and a different cast away from the finished version), but the sheer visual splendor of Mughal-e-Azam shines through. It’s best enjoyed by sitting back and admiring the opulence: the flamboyant fabrics, faceted mirrors and filigreed jewelry. The soirees in gardens and clashes of armies. The gilt on everything from copulas to crowns. 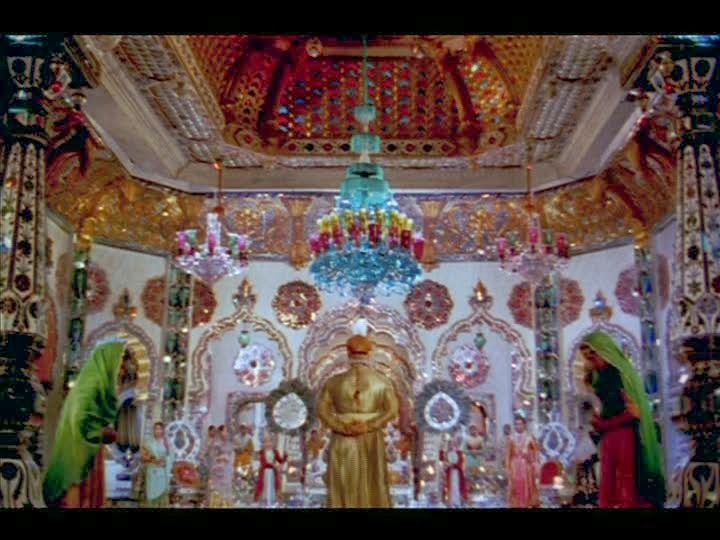 The romance is a flesh-and-blood extension of this theme with Salim and Anarkali part of the visual feast. Dilip Kumar (Salim) and Madhubala (Anarkali) have chemistry, charisma and commitment, even if their tragic love has little resemblance to a real-world relationship, and although scrupulously, even absurdly chaste (in accordance with industry censors), they know how to squeeze every drop of sensuality out of a glance, a gesture or a dance. 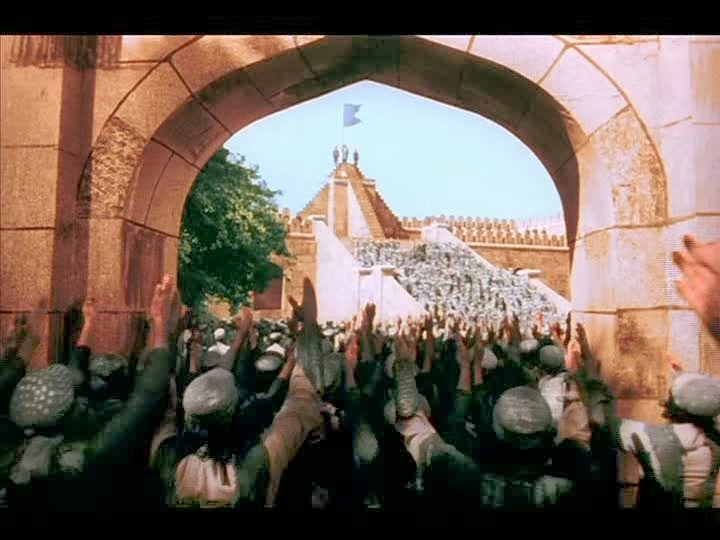 The rest of the film admittedly doesn’t hold up quite as well, but it entertains. The acting and writing, for instance, are heavy-handed and overwrought, firmly in the tradition of grand historical epics. The emotions are presented only in their most intense varieties, which only makes them all the purer to savor. One can also find, behind all the pomp and bombast, interesting conflicts being grappled with: the barriers of caste and class, the primacy of love versus principles, the responsibility to rule versus the right to privacy, the limits of parental and government authority and every manifestation of loyalty put to test. It’s interesting to note that Akbar, as in history, is truly a great leader while his son mostly just wants schmooze with a hot girl, but one can’t help rooting for love. Bollywood is second only to Hollywood in terms of cinematic influence, and surpasses it in terms of film production and viewership. That said, I approach popular cinema (be it from the U.S., India, Nigeria or elsewhere) with a great deal of skepticism and, like many Western cinephiles, I find Bollywood films to be frequently hampered by their long runtimes, ubiquitous songs, limited themes and reliance on formulas, not to mention notoriously sloppy DVD releases (poor transfers, unsubtitled musical numbers, distracting watermarks) further aggravated by endemic piracy. But India is more than just the hindi-based Bollywood; there is also a ‘parallel’ cinema grounded in socially-conscious realism and artistic aspirations, fostered by internationally-regarded auteurs like Satyajit Ray, Ritwik Ghatak, Mrinal Sen, Bimal Roy, Shyam Benegal and Mani Kaul. I chose to write about a film firmly in the Bollywood tradition, but if musical spectacles aren’t your cup of tea try The Home and the World, Salaam Bombay, Subarnarekha, Mr. Shome, Our Daily Bread or Pather Panchali.